This is a perfect example of a rustic Italian dish. 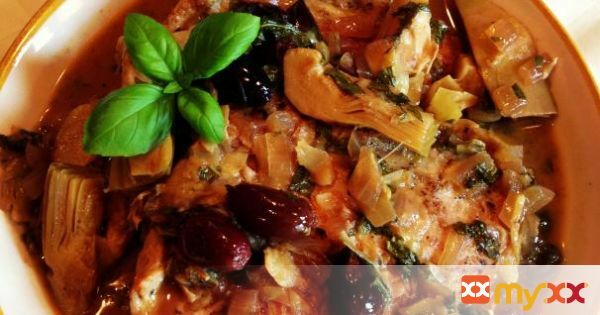 There are just a handful of flavors but they all work perfectly together to create a delicious one pot chicken dish. A couple big juicy bone in skin on chicken breasts, artichoke hearts, onion, kalamata olives, white wine, basil, lemon and chicken broth... thats it! The reason I use bone in skin on in this dish is to prevent drying out. You could also use chicken thighs here and they will be amazing as well!I served some simple roasted potatoes alongside to round out the meal... absolutely delicious and another fantastic example of a clean eating dish that is far from boring!! 1. Season the chicken with salt and pepper. 2. In a large sauté pan, over medium low heat, add a couple drizzles of olive oil. 3. Place the chicken skin side down in the pan and cook until golden brown, flip and cook a few minutes on the other side. 4. Remove the chicken and place on a dish. 5. If the pan is dry add a small drizzle of olive oil again and the onion. 6. Sauté until slightly softened. 7. Carefully add in the white wine and scrap all those delicious bits from the bottom of the pan. 8. Allow the wine to reduce by half. 9. Add in the artichoke hearts, olives and broth. 10. Add the chicken back to the pot and simmer cover for about 20 minutes. 11. Again remove the chicken from the pan. 12. Add in the lemon juice and basil. Simmer for 5 minutes. 13. Pour that fabulous sauce overtop the chicken and enjoy!